When Michael Sam made the announcement, his intention of being the first openly gay athlete in the NFL, we expected speed bumps. We expected Sam’s draft stock slip. We expected athletes would use code words to hide discrimination and fears. We expected “distraction” talk from coaches and general management. But most of all, we, and Michael Sam expected him to persevere and be an NFL player. We didn’t expect where he would be today. Michael Sam seemed to be the type of player who would succeed with the pressure laying on him from this distinction. The world seemed ready for that first NFL player. Previously, Jason Collins, an NBA veteran, came out after the 2012-13 season and eventually was re-signed to a team. The script was set. The pieces were in place. We were ready. Michael Sam would be playing in the NFL. It was time. Today, Jim Popp, the general manager of the Montreal Alouettes, a Canadian Football League franchise, told reporters that he believed Michael Sam was tired. The first openly gay football player is not in the NFL. He is not in the CFL. He is not a football player. Who could blame Michael Sam if he is tired from the last two years. Michael and his father do not have contact today. ‘I’m old school…I’m a man-and-a-woman type of guy.’ As evidence, he pointed out that he had taken an older son to Mexico to lose his virginity. Opinion and results from others went down from there. That quote is from Tony Dungy, former NFL coach and supporter of second chances (like Michael VIck), having a hard time giving a young kid a first. The obstacles didn’t end there. Sam and the Oprah Winfrey Network took heat for signing up for a documentary on his path to the NFL. It was seen as trying to make a star out of himself, though it is hard to see how that is any different than the countless other documentaries and realities shows on players that had done the same. Nevertheless, they agreed to shut down the program shortly after the draft. And that draft, the one which was supposed to lead to Michael Sam being an NFL player? Only one SEC Defensive Player of the Year had ever gone after the first two rounds of the draft. Michael Sam was drafted in the 7th round by the St. Louis Rams. Between 2000 and 2014, only 4 Defensive Players of the Year in the major NCAA conferences had a worse draft result than Sam. Sam would be cut from the Rams before the season, despite being fourth in the league in sacks that preseason. Eventually he would find a foot hold with the Dallas Cowboys’ practice squad before being let go from that as well. At the end of 2014, Michael Sam is not in football. This person, who we believed, and believed himself was ready to be the example for the future for gay athletes in football. He is on Dancing With the Stars. While you cannot blame him for trying to make a living, it was a curious departure for someone who wanted to be a symbol. There was no reason to think this was a problem, after all, he was still going to do the NFL’s first ever Veteran’s Combine, attempting to fulfill his dream. But his quotes started to become muddled, less of a symbol, but more of a person who was not seeing the results he expected. A perfectly find thing for us to know, but coming out of Sam himself was curious. At this point, it seemed clear that Michael Sam had seen his vision of the future heading down a path he did not expect. “Was it a risky move? Yes. But at that moment, the reason why I came out is I thought it wasn’t going to be a big deal. Maybe I was naive. Maybe I thought it was 2014, and people will understand that there’s gay NFL players. There’s gay athletes everywhere. But I was clearly wrong. It was a huge deal. And instead of being a leader, an example, a door-opener, Sam was lamenting other’s who he saw as failing him. Weighing courage is a dangerous game for Michael Sam and yes, he is the one who came out publicly and wanted that mantle, but you have to be willing to take the lumps that go with it. He was only in the position to do so because others, for various reasons, have chosen not to be the first openly gay football player. When Sam made the choice, he knew this. He knew he could be celebrated for this fact. He had to know he could also be left on an island, a footnote – a gay football player, not a football player who is also gay. 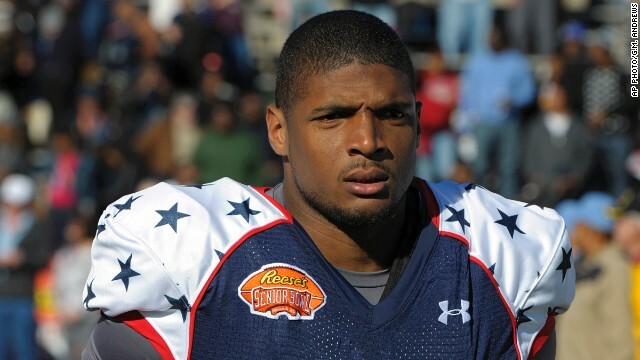 Michael Sam’s career has hit another speed bump. He left the Alouettes this month for personal reasons. Message boards and journalists have wondered if Sam has let down the LGBT community. From an outsider’s perspective, he has not. Whether or not this is the end of Michael Sam’s football career, we have to take in the whole story and remember that Sam is human. We want our heros to be superheros, but many times they are flawed. They make mistakes. They don’t end up in the place we hope they will. And while Michael Sam does not live in Gotham City or Metropolis, it is important to see the position he lives in. Whether or not he becomes the first openly gay active NFL player or not, he has done a lot just by cracking that door open however much he has. At his lowest moment now, hopefully he can see the impact he has had and continue down his earlier path, trying to be that symbol for those to follow. He needs to be that man, not the one who chastises others for not being that person. When there are expectations of big leaps, sometimes the smaller steps get overlooked. Sam needs to see every step as an accomplishment and if that is the only way for him to keep moving down the positive road, he should try to make the most of that. And that’s an expectation we can all hope for.